Rambling Spring Thoughts: So, What Are We to Make of Tennessee? I’ve got no real new information to present to you in the Spring. The SEC Network and ESPNU are showing too much basketball, preview magazines aren’t out yet, and recruiting rankings will have zero effect on the 2015 season. This is my attempt to keep you in the loop with some of Georgia’s potential obstacles for next season. If you’ve been following the postseason podcasts, blogs, and Signing Day chatter, there are a LOT of people picking Tennessee as the darkhorse in the SEC East for 2015. Why the unbridled optimism for a team that yet again failed to finish .500 in league play? For a team who will have about 2/3 of its players in their first or second years in the program? 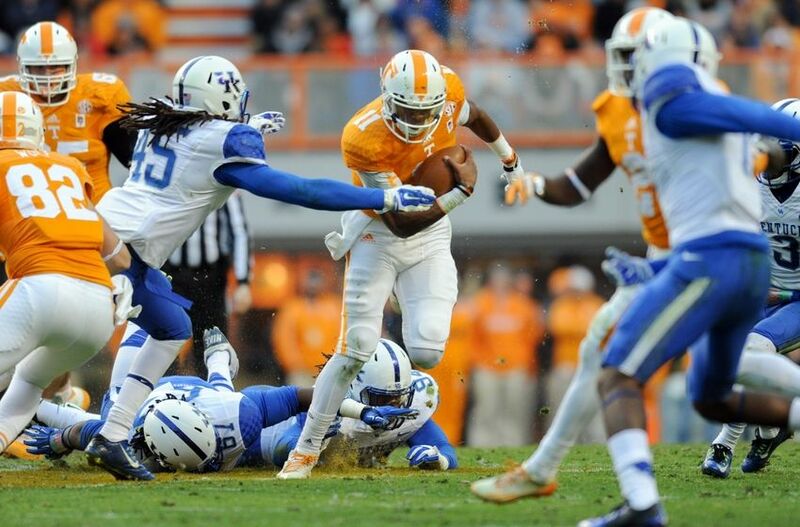 There’s a lot that could go right for the Vawls in 2015, but a lot that could go wrong too. I spent all preseason last year shouting from rooftops that Marquez North was the second best wideout in the SEC. He rewarded me with…30 catches for just over 300 yards in an injury-plagued sophomore campaign. Joining him in and out of the lineup were Josh Malone, Von Pearson, and Pig Howard, all highly-rated guys in their own right. As their WR’s grow up, this passing offense becomes prolific. The 2014 Vols replaced all 5 starters on their offensive line from the previous year. This year? Just one. That paves the way for massive human being Jalen Hurd (899 yards, 5 TD as a freshman) to continue to do his thing. So yes, Tennessee’s offense is highly, highly skilled. I said it in the intro, I’ll say it again. Signing Day 2015 will have almost no effect on this year’s results. Having said that, Tennessee pulling in it’s third straight top-10 class is admirable confusing things that make you go ‘hmm’. This year, the focus was more on reloading the defense, as they brought in two consensus five star tackles in Kahlil McKenzie and Shy Tuttle. On the field, the Vols won 4 of their last 5. A convincing win against Iowa to close out the season is another cause of this ‘contender’ optimism, but say it with me one more time: BOWL GAMES ARE OVERRATED! Did I dig into the defense? Nah, not yet. They lose A.J. Nicholson though, and he was a monster. With a permanent crossover rival in Alabama, the Vols’ schedule always appears among the most daunting in the league. With a series against Oklahoma finally ending this year, it daunts all the more. The Vols play six straight games (all but a trip to Florida are at home) to open the season, concluding with a home date against Georgia on October 10. Coming off the bye, they go to Alabama and then play November against the fairly pedestrian SEC East. There is the OUTSIDE chance that Butch Jones’ third Tennessee team plays to a similar trajectory of Hugh Freeze’s at Ole Miss. Early opportunities to pick up high-profile wins against Oklahoma and Florida, and a home tilt with Arkansas, could theoretically boost the Vols into the top 10 before Georgia comes knocking. Or, s**t hits the fan as it has done for the past decade, and we have another 5-7 win Tennessee team, with a fanbase angling for someone to come in and coach up all the talent Jones has inexplicably assembled in Knoxville. NEXT: IDK, whoever I feel like. Probably South Carolina though. Posted on March 3, 2015, in 100 Days of SEC Dominance, Blog, Georgia Bulldogs, Spring Previews, Tennessee. Bookmark the permalink. Leave a comment.